No new additions to the leaderboard database, but the top cash is for someone who’s never been mentioned here: Roderick Chavez from Bellevue took 1st place at the WPT Five Damond NLHE Seniors tournament Wednesday at Bellagio, beating out at least three others at the final table with more than $500K each in lifetime winnings. Roderick has about $44K after winning more than $30K in the tournament. A veery nice way to close out the year. 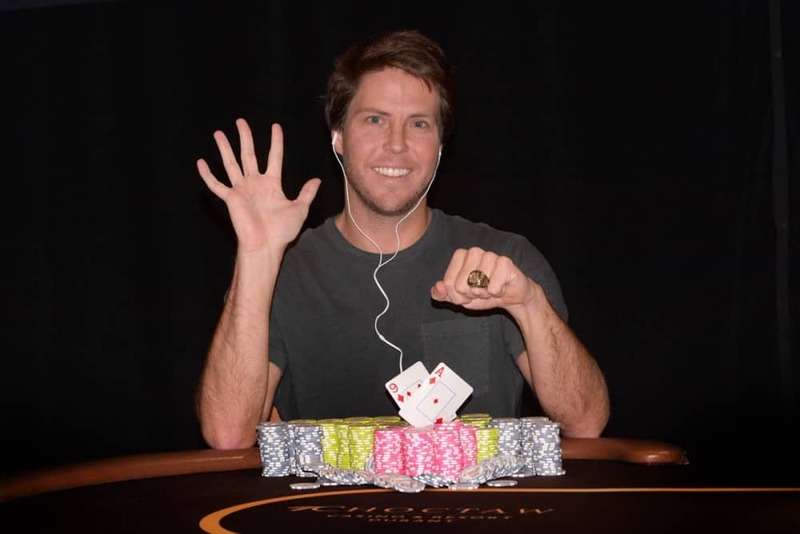 Dylan Wilkerson continued his streak to the end of 2018, winning WSOP Circuit Planet Hollywood #4 NLHE, a $400 buyin with 176 entries. Steve Chanthabouasy says he’s out of the mix games and focusing on NLHE tournaments for the big money, which he’s certainly got a point about after winning the 174-entry $560 buyin WPT Five Diamond #4 NLHE. There was a deal heads-up, and the other player got a little more money, but Steve got the win. Angela Jordison may be laying odds as to which lasts longer: my poker retirement or Steve sticking to NLHE. 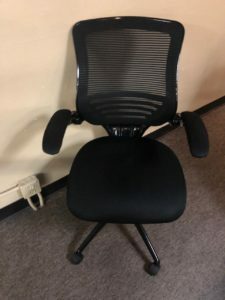 You’ll be back. Two cards in cash games = boring!! Rafael Lebron from Puyallup made the final table of the WSOPC Planet Hollywood $500K GTD Main Event, taking 9th place. If you aren’t familiar with Lebron, his fourth-ever recorded cash was winning a bracelet in the $3K buyin Limit Hold’em 6-Max in 2016. That was four days after he was runner-up foor a bracelet in the PLO 6-Max. Usually, a 26th-place finish isn’t enough to get you on the leaderboard even if it’s a big buyin, I try to limit it to significant ROI or I’d be overwhelmed, but Auburn’s Thomas Kornechuk took that spot in the $3500 buyin WPT Seminole Hard Rock Main Event, which had nearly 900 entries, so yeah. It’s good enough. The chances of beating my self-imposed deadline/goal of $100K in earnings by the end of the year is getting increasingly more unlikely. Last night’s liquidity error at the Final Table $20K really reduce any possibility of putting together the seed money for a trip to somewhere I could run it up. The shot at the WPT Five Diamond is gone. Pretty much down to Venetian events at this point, unless something happens where I can look further afield. Next weekend will be all about the Portland Meadows $30K GTD NLHE. The Wynn Signature Series runs through Monday. The WPT Five Diamond Main Event at Bellagio starts Tuesday. The Colorado Poker Championship Winter Series runs through 19 December at Golden Gates Casino. The $1,100 buyin Main Event has three starting flights on 13–15 December. The Bicycle Casino WSOPC Los Angeles Main Event is this weekend, but they host a Quantum event next week with $250K GTD and a $350 buyin. Two flights a day from Wednesday through Saturday. The Venetian/CardPlayer Poker Tour Deepstack Showdown ends 16 December with a tantalizing $3,500 buyin $500K GTD starting 14 December. Closer to home, in the Sacramento area, is the Stones Gambling Hall December Chill Poker Series/Run It Up Stones, through 16 December. The last event (ever) on my calendar is the Venetian Deepstacks Extravaganza V. Which starts 20 December. There’s a $100K GTD the first weekend, and a $260K GTD Monster Stack just before the New Year’s ($400 buyin). The cards in the header were up by the cash registers at the Mall 205 Dollar Tree this afternoon, in case you’re looking for stocking stuffers. After the rush of names from Chinook Winds and Wildhorse, we’ve just got a few entries in this week’s report. Lawrence Hommedieu of Washougal was down at the WPT Seminole Rock N Roll Poker Open and made the final table of Event #2 $250K GTD NLHE for a best-ever cash (he also picked up a smaller cash in a bounty tournament). Lee Watkinson added a small percentage to his lnearly $4.3M lifetime earnings with 5th place in the Venetian Deepstack Extravaganza IV $400K GTD NLHE Main Event. Finally, Geran Sanders (Ellensburg) chopped a RUNGOOD Poker Series $25K NLHE at Hard Rock Tulsa heads up for a very decent return on a $180 buyin in a field of more than 400. New Year’s Day is in exactly five weeks, and I’ve committed to my wife to playing only the home game after that point—unless I win more than $100K before the end of the year. $2K down, $98K to go. 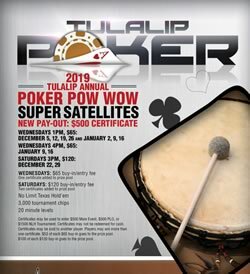 This was, perhaps, a poorly-chosen date, as the Tulalip Poker Pow Wow runs through January, and Chinook Winds PACWest Poker Classic runs 16–24 February. But you have to draw your lines in the felt somewhere. December is always a tough poker month. Schedules are thrown off by the Christmas holiday. This month is our 30th anniversary, there’s holiday parties, other family obligations, and getting flights is more expensive because of all the holiday travel. I’m supposed to be in town for something on Sunday the 9th, I’ve got something I could probably skip on on the 15th if I absolutely had to, then after that the only series on the West Coast is the Venetian Deepstack Extravaganza V.
Trying to make the goal of another $98K means I have to be I’ll be playing the $10K at Final Table this Friday. If things go well, I’ll get a Saturday morning flight to either Las Vegas, for the Wynn Signature Series $250K GTD NLHE. Sunday, the Wynn has a $5K NLHE Survivor with a $550 buyin. The WPT Five Diamond series is running over at Bellagio. The next Friday there should be a $20K GTD at Final Table, and since I have something for Sunday, my weekend option would be to go to Vegas for the WPT Five Diamond Main Event Super Satellite. The Main Event runs the next week. The following weekend is a $30K GTD at Portland Meadows, but out of town is one of the few opportunities to get to anything approaching $98K in a single shot: the Venetian;/CardPlayer $500K GTD NLHE Main Event. A couple of downsides: its last entry day is on a Friday, so I’d need to take the day off; and its buyin is $3,500, so I’d probably want to take off Thursday to play the last satellite. Alternatively, that weekend is also the last event of WSOPC LA, and the Bicycle Casino has a $350 buyin with $250K GTD. The Main Event of the Colorado Poker Championship runs that weekend, as well. As Christmas approaches on the next weekend, the Venetian Deepstack Showdown has ended and the Venetian Deepstack Extravaganza V has begun, opening with a $100K GTD, and it’s pretty much the only game in any town so far as tournament series in these parts (loosely speaking) goes. 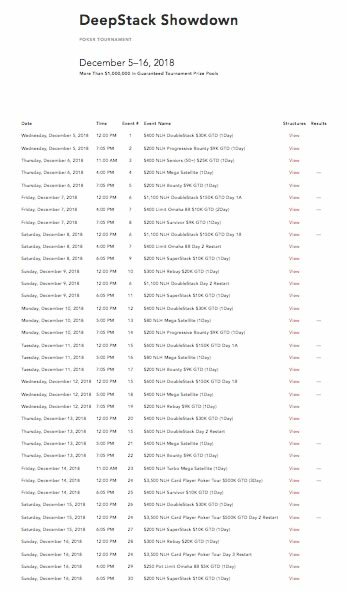 My last chance, Hail Mary opportunity is going to be the Venetian’s $400 buyin $260K GTD tournament running the week before New Year’s. So maybe I should just book those tickets now. The Deepstacks Poker Tour Championship is in Calgary at Grey Eagle. The Canadian dollar is about 76¢ US. The opening event is a C$100K GTD for C$550 buyin. The Main Event has starting days Friday and Saturday, with a C$2,500 buyin and C$1M GTD. The Wynn Signature Series starts tomorrow. Opening weekend has a $250K GTD $600 buyin and a $50K GTD $550 buyin $5K payout Survivor. Next weekend has a $150K GTD ($600 buyin) and $30K GTD $3K payout $300 buyin Survivor, with a number of other events between. The WPT Five Diamond at Bellagio starts Thursday. There’s a $1,620 NLHE 6-Max on 3 December, $1,620 PLO the next day, and lots of satellites to the $10,400 Main Event starting 11 December. The Colorado Poker Championship Winter Series runs from Thursday to 19 December at Golden Gates Casino, It features 25 events including a $2K buyin High Roller. The $1,100 buyin Main Event has three starting flights on 13–15 December. The Bicycle Casino hosts the final West Coast WSOP event of the year: WSOPC Los Angeles from 1–16 December. The first week is the $250K GTD NLHE Monster Stack, with starting flights inconveniently placed two-per-day on Monday and Tuesday. Ditto for the Main Event starting days of Sunday and Monday (11 & 12 December). FU, too, WSOP. The Venetian/CardPlayer Poker Tour Deepstack Showdown runs 5–16 December with a tantalizing $3,500 buyin $500K GTD starting 14 December. Closer to home, in the Sacramento area, is the Stones Gambling Hall December Chill Poker Series/Run It Up Stones. 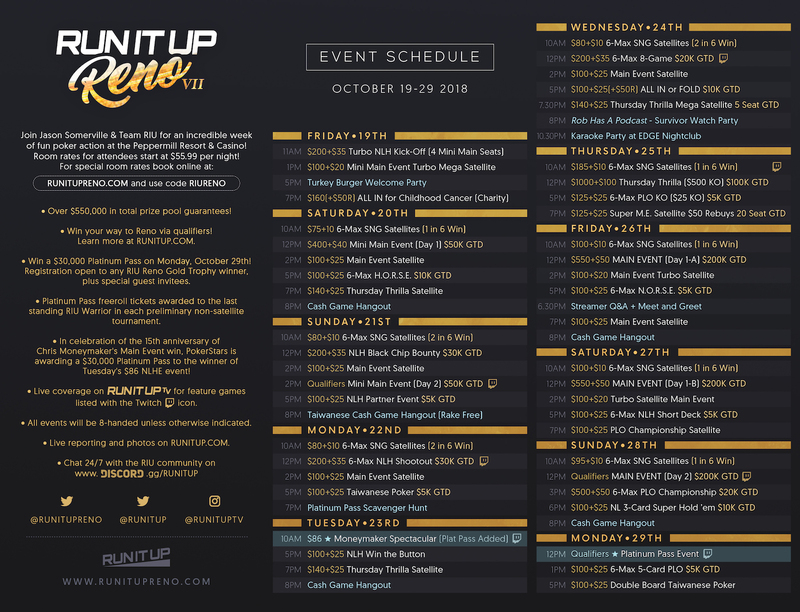 Run It Up has an abbreviated version of its Reno schedule with a $600 buyin Main Event and smaller PLO/NLH Mix, NLHE Win the Button, and PLO 6-Max ($500 buyin for the last one). That’s followed by a $100K GTD Quantum event with three buyin levels ($120, $240, and $900) and a total of 10 entry points (including the high buyin direct to day 2). 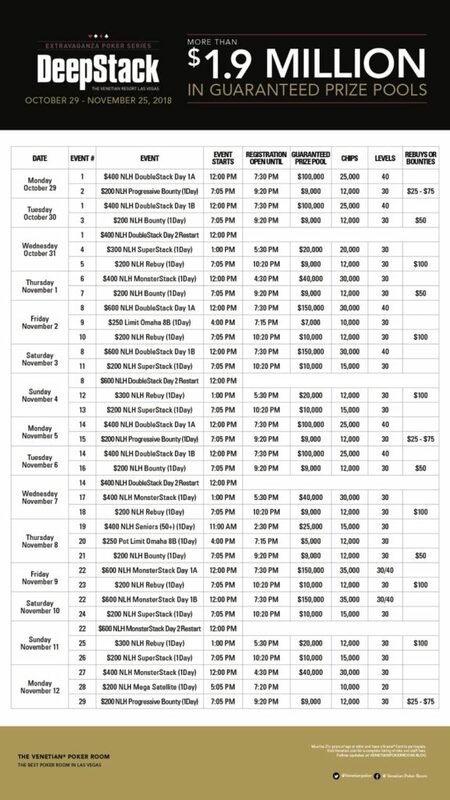 Outside of Minneapolis, the Mid-States Poker Tour Season 9 Finale is technically already running, with satellites all through November already for the $1,100 buyin $500K GTD Main Event with entry days 6–8 December. Non-stop flights are running $230 RT, and with direct flights and a 3pm start time, you wouldn’t even need to leave Portland until 7am Saturday. You’d get to Minneapolis with two-and-a-half hours to cover 22 miles from the airport to Canterbury Park. The last event (ever) on my calendar is the Venetian Deepstacks Extravaganza V. Which starts a whole four days after the Deepstack Showdown. There’s a $100K GTD the first weekend, and a $260K GTD Monster Stack just before the New Year’s ($400 buyin). I’d been hoping that results from either the Chinook Winds or Wildhorse series would be posted on Hendon Mob before I had to do another update of the Leaderboard, but I’m running out of time and as everyone knows by now, Max Young won more than a quarter of a million dollars (and a fifth ring) this week at the WSOPC Choctaw Main Event. As anyone who’s been around Portland poker for a few years knows, Max was a regular here not that long ago before he headed out of town for the big money. At least I can say I got sucked out on by greatness once or twice. By the way, that was Max’s second WSOPC Ring this month (so far), he got another one in WSOPC Lake Tahoe Event #11 NLHE (with a final table and another cash at Choctaw in-between). Before that, he hadn’t won a Main Event for almost a month! Ryan Stoker took 5th in the WSOPC Lake Tahoe Main Event after a small cash in the preceding Event #9 NLHE Big Blind Ante. PokerTime fixture Jake Dahl had a string of cashes at WSOPC Lake Tahoe, with three final tables, including 4th place in Event #9 NLHE Big Blind Ante. Making it onto the list for the first time in the last weeks before it disappears completely are Washington’s Dan Wood, with 7th in the Talking Stick Resort Seniors Open, and Kang Chua for a win in the Venetian Deepstack Extravaganza IV Event #22 NLHE Monster Stack. Back in the early days of this blog, I got it in my mind to get to EPT Prague for my 50th birthday. My thinking was that—aside from the series starting near my birthday every December—my wife is a Christmas fan, Prague is the home of Wenceslas Square and a famous holiday market, and it would be less galling to travel to a poker destination if it was someplace she actually would enjoy (Vegas is not on that list). So I spent the summer trying to get myself in the position where I could (as an umemployed freelance programmer without any work) manage to swing the kind of win I cold parlay into a European trip. That didn’t happen until mid-November—kind of late to be making Prague travel plans—and even more difficult was that a lot of the series took a break around Thanksgiving, so the night I won $4K at Encore, I flew to Vegas to play waaaay above my weight in a $2,500 buyin at the Venetian. That’s actually what led to the calendar. Now I’m in a sort of similar predicament. I haven’t had a four-figure profit since the summer, I hit a downswing in my Thousandaire Makers on Ignition, and the end of my poker life approaches. I gave myself an out my promise to my wife to quit poker is contingent on me not cashing for $100K before the end of the year. But I’m a working stiff, there are more holidays between now and then than I can shake a Yule log at, not to mention I gotta shake some money out for property taxes and I should probably do something special for our 30th anniversary. So I’m looking at the events below very carefully. It’s back to normal schedules at Final Table with the $10K GTD tonight (after a couple of weeks with reduced guarantees because of events at Chinook Winds and Wildhorse). And the great $10K at Portland Meadows. The Venetian Deepstack Extravaganza IV runs through 25 November. The big event of the series is the $1,600 buyin $400K GTD Main Event starting today with another entry day tomorrow. Tonight is a $300 buyin Survivor tournament at 7pm (pays $2,500, do not leave your money on the table). There are two $400 buyin $100K GTDs next week. WSOPC Las Vegas started Wednesday at Planet Hollywood, with a $400 buyin $200K GTD tournament. The Main Event has starts next Saturday and Sunday. 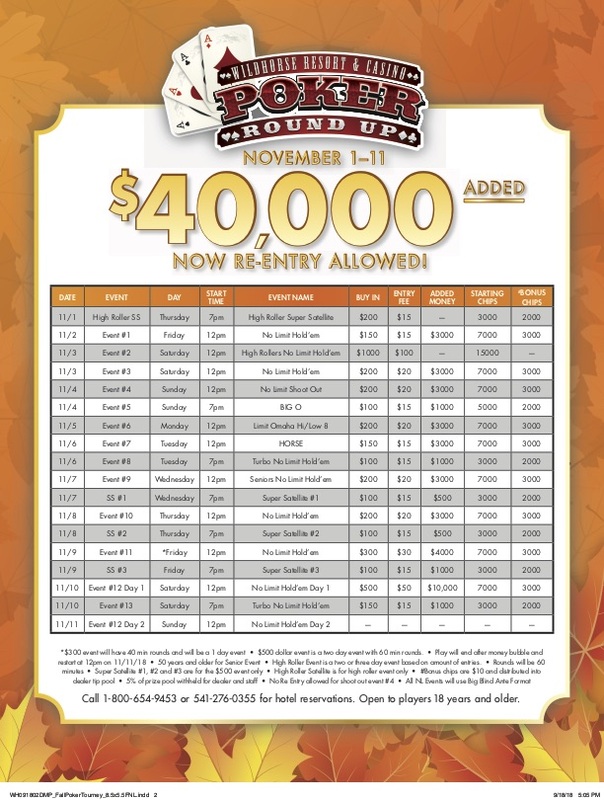 The 20th Annual Lucky Chances Casino Gold Rush finishes this weekend ($1,080 buyin, starting Friday, Saturday, or Sunday) with $100K to the first-place finisher. 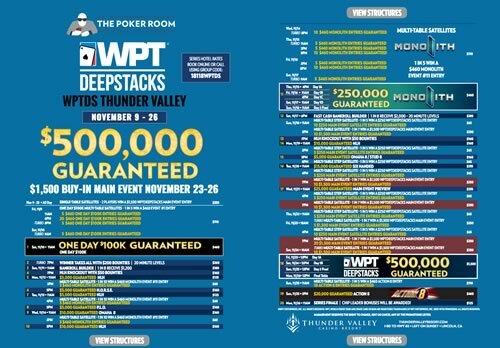 North of Sacramento, WPTDeepstacks Thunder Valley has the $460 buyin $250K GTD Monolith this weekend, with the $1,500 $500K GTD Main Event starting Friday and Saturday after Thanksgiving. 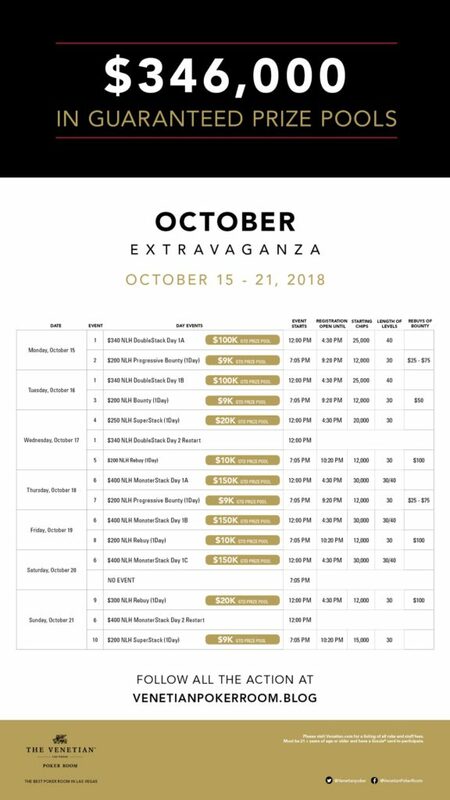 The LA Poker Open at Commerce Casino is closing out this weekend with a $1,100 $500K GTD Main Event (Day 1 Friday and Saturday) and a $1,100 buyin Survivor paying $5,000 to 20% of the field. The Muckleshoot Casino Big Bounty tournament ($200 buyin) is Sunday at 10:15am. Their monthly Deepstack ($300 buyin) is next Suunday at the same time. The Deepstacks Poker Tour Championship is in Calgary next Thursday (it ain’t Thanksgiving in Canada) at Grey Eagle. The Canadian dollar is about 76¢ US. The opening event is a C$100K GTD for C$550 buyin. The Main Event has starting days 30 November and 1 December, with a C$2,500 buyin and C$1M GTD. You can get direct flights on Air Canada from Portland for $240 (US) RT if you buy now. It’s closer than Vegas. Plus, you’re in Calgary as winter is coming. The Wynn Signature Series starts 28 November. Opening weekend has a $250K GTD $600 buyin and a $50K GTD $550 buyin $5K payout Survivor. The next weekend has a $150K GTD ($600 buyin) and $30K GTD $3K payout $300 buyin Survivor, with a number of other events between. 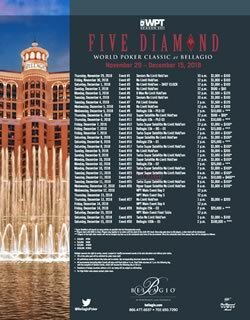 The WPT Five Diamond at Bellagio starts 29 November. There’s a $1,620 NLHE 6-Max on 3 December, $1,620 PLO the next day, and lots of satellites to the $10,400 Main Event starting 11 December. The Colorado Poker Championship Winter Series runs 29 November to 19 December at Golden Gates Casino, It features 25 events including a $2K buyin High Roller. The $1,100 buyin Main Event has three starting flights on 13–15 December. Last year’s Winter Series Main Event had a prize pool of just under $300K (Max Young took 4th, natch). The Bicycle Casino hosts the final West Coast WSOP event of the year: WSOPC Los Angeles from 1–12 December. The first week is the $250K GTD NLHE Monster Stack, with starting flights inconveniently placed two-per-day on Monday and Tuesday. Ditto for the Main Event starting days of Sunday and Monday (11 & 12 December). FU, too, WSOP. The last event (ever) on my calendar is the Venetian Deepstacks Extravaganza V. Which starts a whole four days after the Deepstack Showdown. There’s a $100K GTD the first weekend, and a $260K GTD Monster Stack just before the New Year ($400 buyin). There’s my fallback. The last couple days of the Chinook Winds Fall Coast Classic were extra-disappointing, mostly because I didn’t cash, but also because it was the last trip I have planned before I hang up my card caps. Event #14 $100K GTD NLHE 6-Max got off to a bad start, as I flopped a set of queens early but got caught by a turned Broadway. Another pair of queens went bad and I was down nearly 20K from the 500K starting stack in the second 50-minute level. I managed to claw my way back to starting stack, but the decision to play back against an aggressor who was consistently attacking my blinds cost me my tournament when I called from the big blind with 3x5x, flopped bottom two pair, re-raised his continuation, then led out on the turn. With almost half my stack in good, the river paired the wrong card on the board and my two pair was counterfeit. I shoved, and he eventually called with an over pair, knocking me out. The next day’s Final Event $200K GTD NLHE went better at first. In addition to three pairs of kings in just over four hours, a late registrant sat on my right picked up kings in the small blind when I had aces in the big blind, and ended up all in for a full starting stack preflop. By dinner break, the end of registration, and the addon, I had more than three times the starting stack. A gentleman named Don (think the Lone Biker of the Apocalypse from Raising Arizona if he’d retired and gone to live in Palm Springs) held sway over the table, with a couple of Portland regs chipping away at my stack until I was down to about average over the next ninety minutes. Then—like a dream—it was all gone in a hand where I put 60bb in with top-top on the turn against an over-pair shove. Busted by a pair of nines two days in a row. A bit bittersweet, because Chinook Winds has been where I’ve had the most recorded cashes, and I’m not going to be playing there again in the foreseeable future. Tonight is the first event: the one-and-only super satellite for Saturday’s High Roller in Pendleton. No commentary here, just a link to the schedule and structures. Results from Chinook haven’t posted yet, so news for PNW players is a little slim, but Mercer Island’s David Oppenheim picked up a couple nice scores in the past few weeks, with 3rd place finishes in the Muckleshoot Fall Classic Event #5 and at Run It Up Reno Mini Main Event. They’re his two largest recorded cashes, by a significant margin. Oregon’s Landon Moore grabbed 15th in the Venetian $500K GTD Championship in mid-October, an event headlined by Steve Sung and Joseph Cheong. It’s Moore’s second recorded cash. James Romero cashed 7th in another big tournament, the 113-entry WSOP Europe Event #8 1M NLHE High Roller. #FallCoastClassicPokerTournament Event 5 $75K NLHE. HELP! I’m in a @StokersPoker / @Mawkswell sandwich! 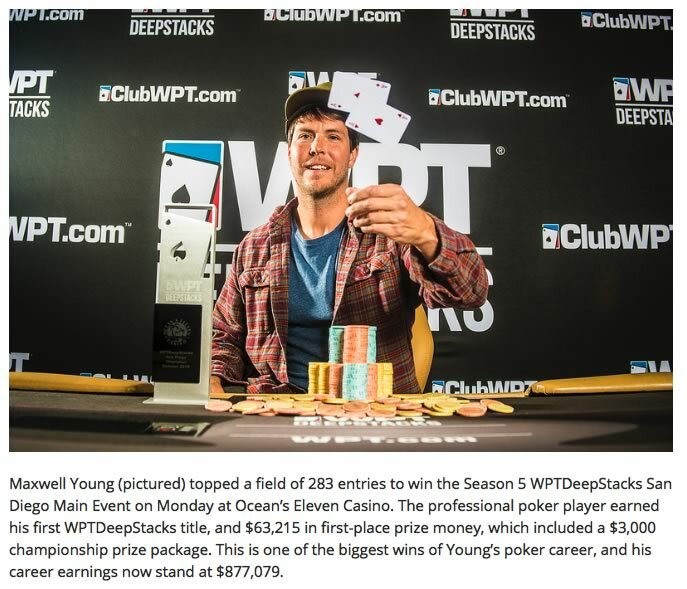 Back in the States, Max Young won WPT Deepstacks San Diego Main Event just before he returned to Oregon to play at Chinook Winds. Our last update of this edition is (once again) Dylan Wilkerson with 6th place of 68 entries at WSOPC Hammond Event #13 NLHE High Roller. WSOPC Lake Tahoe Main Event starts tomorrow. The Venetian Deepstack Extravaganza IV runs through 25 November (Thanksgiving is the 22nd this year). The big event of the series is the $1,600 buyin $400K GTD Main Event starting 16 November. See above for info on the Wildhorse Fall Poker Round Up. The HPT Championships are at Ameristar East Chicago through 13 November. The Main Event buyin for this annual event goes up to $2,500. If you’d rather be close to the ski slopes, Mid-States Poker Tour Colorado runs through the 11th, finishing with $300K GTD for a $1,100 buyin. The Commerce Casino LA Poker Open starts Friday. It features 18 events over 17 days, with a $500K GTD Main Event. Just west of Edmonton, Alberta, River CreeKing of the Felt Deepstack Championship resort starts Saturday, with seven events including PLO, NLHE/PLO/Crazy Pineapple/Limit Omaha Mix, and 2 “Limited” Holdem events! Their C$1,100 Main Event gets you 125,000 chips! 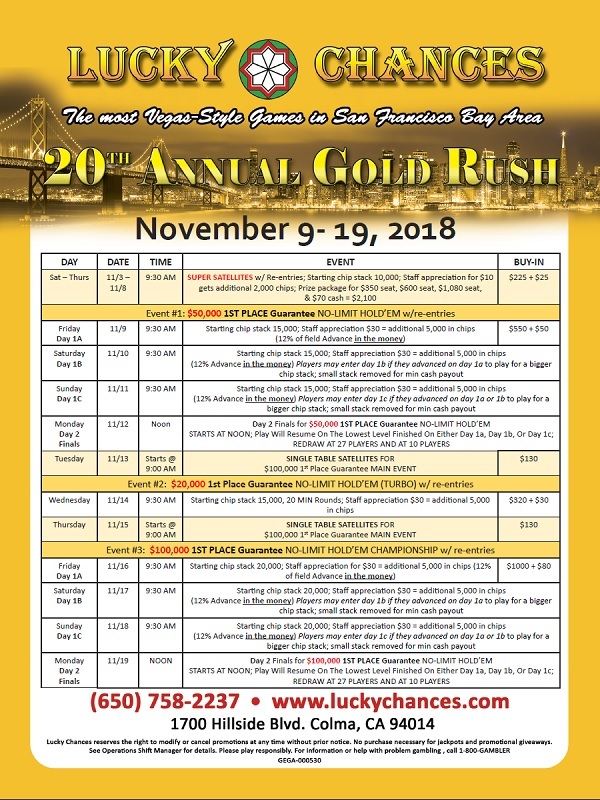 The 20th Annual Lucky Chances Casino Gold Rush starts next Friday south of San Francisco, with 3 events, guaranteeing $50K, $20K, and $100K to the first-place finisher of each. North of Sacramento, WPTDeepstacks Thunder Valley also gets under way a week from Friday, with 20 events, including small-guarantee HORSE< PLO, and O8 tournaments, and three tentpole NLHE events of $100K, $250K, and $500K guaranteed. Two weeks from Friday, the WSOPC Las Vegas opens at Planet Hollywood, with a $400 buyin $200K GTD tournament. 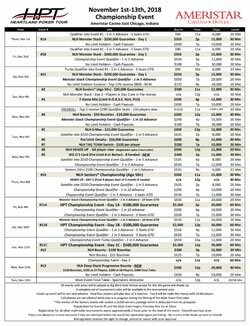 1,700 The Main Event starts 24 November (the Saturday after Thanksgiving) and features a $500K guarantee. 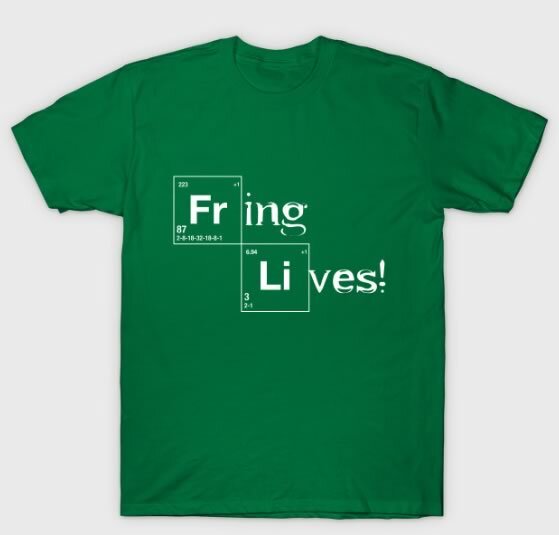 It’s here again! 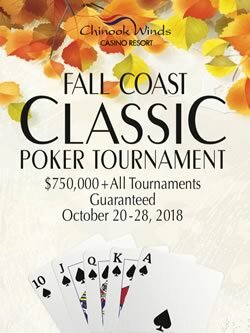 The Fall Coast Classic is my last planned excursion before the Poker Mutant phase of my life is over, and I’ll be in Lincoln City from Saturday morning through to at least Day 1 of the Final Event. The series kicks off with 2-day $150K GTD NLHE tournament: $255 entry (15K chips) with re-entry through level 6, $25 fee, $10 dealer appreciation (2K chips), and a $100 addon (10K chips). Day 1 starts at noon on Saturday, with Day 2 at 11am Sunday. Saturday through Tuesday at 6pm there are satellites for the Final Event with 10-Seats GTD. The prizes are vouchers worth $575 toward the Final Event buyin. Buyin (and rebuy) is $30 6K chips), with a $10 fee and $10 dealer appreciation (1.5K). 10K chips for the $30 addon after registration closes. Sunday and Monday at noon are two nearly-identical events: $75K GTD NLHE for just $190 entry (10K chips), $10 fee, $10 dealer appreciation (2K), and an addon for $100 (10K). Sunday’s game allows re-entry; Monday’s is no re-entry. Tuesday at 11am things slow down a little, with a $25K GTD NLHE Seniors. For players in the 50+ age category, the buyin is $110 (10K), $10 fee, $10 dealer appreciation (2K). Re-entry for six levels but no addon. Wednesday at noon is $15K GTD Omaha Hi-Lo. Also a freezeout, with $140 buyin (10K), $10 fee, $10 dealer appreciation (2K). Wednesday and Thursday evening at 6pm are 5-Seat GTD satellites for Friday’s High Roller 6-Max tournament. Buyin is $120 (6K chips) with $10 fee and $10 dealer appreciation (1.5K chips). Reentry through level 6, with prizes being $1,075 toward an entry into the 6-Max. Presumably, the satellites will be played as 6-Max. Thursday offers two mid-day options. At 11am is the $50K GTD NLHE Big Bounty and at 1pm it’s the $25K GTD Big O. The Big Bounty game is single re-entry, with a $625 buyin (including $200 bounty) for 25K in chips, $25 fee, and $10 dealer appreciation for another 5K in chips. The Big O tournament is unlimited rebuy with an addon: $140 buyin (10K chips), $10 fee, and $10 dealer appreciation (5K chips). Addon after registration closes is $80 for another 10 in chips. This and Wednesday’s Omaha tournament are the two non-NLHE offerings on the schedule. Friday noon is the largest buyin event of the series: $100K GTD NLHE 6-Max. Reentry for 6 levels, with $1,025 buyin (40K chips), $50 fee, $25 dealer appreciation (10K chips). Friday evening at 6pm is the Final Event 20-Seat GTD Mega Satellite. $140 buyin (10K chips), $10 entry fee, $10 dealer appreciation (2K chips). payouts are vouchers for $575 against the Final Event buyin. The final Saturday morning at 10am is a Final Event 5-Seat GTD Turbo Satellite. $50 buyin (10K), $10 fee, $10 dealer appreciation (2K). This also pays $575 vouchers. The $200K GTD Final Event starts at noon the same day (with Day 2 on Sunday). You get 30K in chips for your $525 buyin and $50 fee, another 10K in chips for the $25 addon, and 30K for the $200 addon available after registration closes at the end of level 8. There is no reentry for this tournament! Results from the Muckleshoot Fall Poker Classic just posted and the winner of their Main Event is naturally near the top of the leaderboard new mentions this week. Santosh Singh of Seattle is extra-near because not only did he win the 2018 Fall Main Event, but Hendon Mob is just posting that he cashed in 3rd place for almost as much money in the 2018 Spring Main Event. Those are two of his three recorded cashes. Sean Vance from Tacoma cashed twice at the Classic, taking 8th in Event #2 $100K GTD NLHE and 3rd in the Main Event (also 2 of only 3 recorded cashes). Thomas Hess of Puyallup picked up 4th in the Main Event for his 4th cash. Dennis McLeod (Federal Way) won Event #5 $100K GTD NLHE after placing a respectable 15th in Event #1. Edmonds’ Sharlene Fowler doubled her number of cashes with 5th in Event #5 and 1 12th in Event #2. Rich Bustamente of Lake Forrest got his first cash with 3rd place in Event #2, and James PraseuthEvent #1 $80K GTD NLHE from Tukwila did the same with a win in . On the side ot the familiar names, Dylan Wilkerson went across the Pacific for WPT Vietnam and the Asian Poker Tour where he racked up four cashes over a couple of weeks, including 7th in the WPT Vietnam Event #10 ₫ 44,000,000 NLHE High Roller (the Vietnamese dong is about 23,000:1 against the US dollar, so the buyin was just under $1,900); 2nd in the Asian Poker Tour ₫ 100,000,000 + 7,500,000 NLHE Super High Roller, and a win in the Asian Poker Tour Event #7 ₫ 50,000,000 + 4,000,000 NLHE High Roller. Lynnwood’s Josh Sepulveda won Event #2 at Muckleshoot for his largest-ever cash. Casey Ring (Salem) came in 6th in the Muckleshoot Main Event. Jake Dahl picked up 2nd in Event #5. Adam Coats had four cashes in the six-event series: 11th in Event #2; 2nd in Event #4 $15K GTD PLO; 18th in Event #5; and 4th in Event #7 NLHE Shootout. Chad Wassmuth went down to Las Vegas for the Wynn Fall Classic $150K GTD NLHE and picked up 5th place. And to wrap this edition of the leaderboard up, Ronald Lemco took 2nd place in the Muckleshoot Event #1. From an in-the-money standpoint, my week went pretty well! I only played nine tournaments but I cashed twice. Unfortunately, they were both on the small end of my buyins. 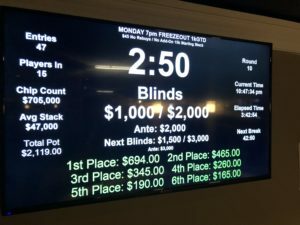 I got to the Monday night freezeout at Final Table and got out with time enough to head over to Portland Meadows for their evening game, which went a lot better until the point where we were at 2 tables and a shorter stack with Jx4x shoved, and I called with A♦7♦, only to get cut down to 3bb when he made a pair. The Friday night $10K GTD at Final table didn’t go well, either, with me making a couple of bad and frustrated calls when I knew I all I was beating was a total bluff. Saturday night, I fired up an Ignition Casino $7 NLHE Jackpot Sit-N-Go and caught a $35 5x payout (the bottom level pays just 2x the buyin). I put that away quickly, then jumped into a $500 GTD PLO Turbo where I took 19/82 but no cash. 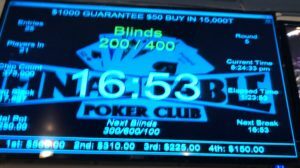 The next night, practicing up for the limit Omaha game at Chinook, I late-regged an O8 game, and by the time the first break came around in about 15 hands, I had gone from 5K to 26K and the chip lead. I stayed at or near the lead for most of the rest of the tournament, then had a couple hands go wrong at the final table, ending up 6/57 for a small cash. A late entry after our Sunday dinner guests left went bad when I called with QxTx from the big blind, got to the turn with an open-ended straight draw and half my chips in the pot, then chickened out facing an all in on the river. The rabbit cam showed an Ax on the river that would have given me Broadway. I really should turn that feature off. The other two Ignition tournametns I played that night didn’t go anywhere. Saving up the good play (or the luck) for Chinook! I wold be incredibly remiss if I neglected to mention that poker superstar Jacki Burkhart submitted a story for the #mypokerstory PokerStars Platinum Pass competition curated by author Maria Konnikova. She’s one of six finalists for one of the $30K Platinum Pass packages ($25K buyin to a high roller tournament at the Pokerstars Caribbean Adventure and $5K in expenses). Bicycle Casino‘s Big Poker Oktober has one more $500K GTD event remaining on the schedule. Canterbury Park Casino‘s Fall Poker Classic runs through 21 October outside Minneapolis. WSOPC Chicago (actually northwest Indiana) is on, featuring a $1M GTD Main Event overlapping the first weekend of the Chinook Winds series. Stones Gambling Hall Fall Classic runs to 21 October. 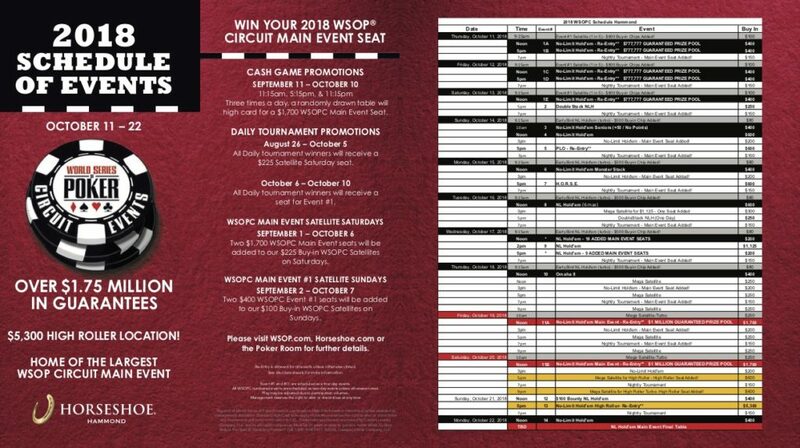 The Main Event starts Thursday and is $500 for entry and $150K GTD. 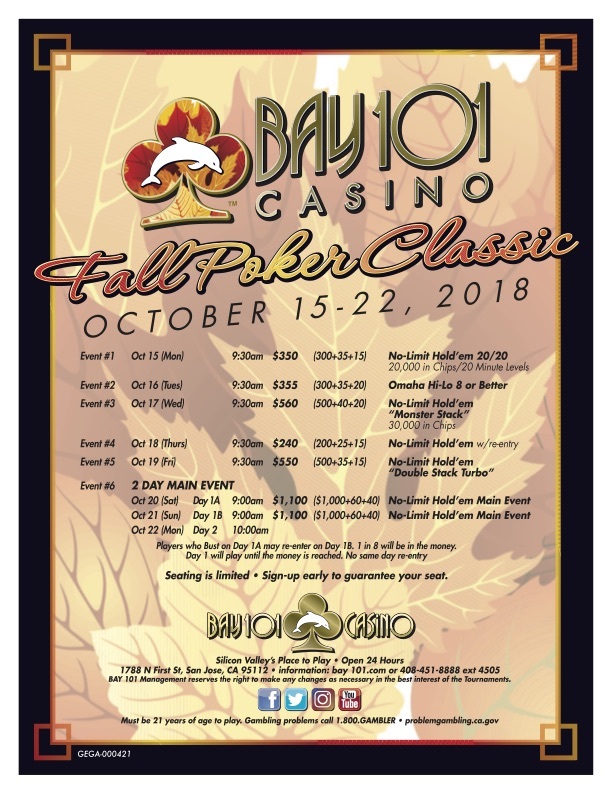 The Bay 101 Fall Poker Classic Main Event ($1,100 buyin) has entry days on 20 & 21 October. The Venetian October Extravaganza started Monday. There are a couple $100K events and a $150K, plus a couple Progressive Bounty tournaments. The folks at Calgary’s Cash Casino Wild West Shoot Out need to get their web act together. The image they posted of their flyer is too small to read and isn’t linked to a larger version but PokerAtlas has it. It starts today and runs to the 28th. Run It Up Reno has one of the more eclectic schedules with PLO KO, NLHE 6-Max, NORSE, 6-max HORSE(!) and a lot more, mostly for $125–$250 price points. I’ve heard it’s a lot of fun. Starts Friday. The Chinook Winds Fall Coast Poker Classic is Saturday! I’m so excited! 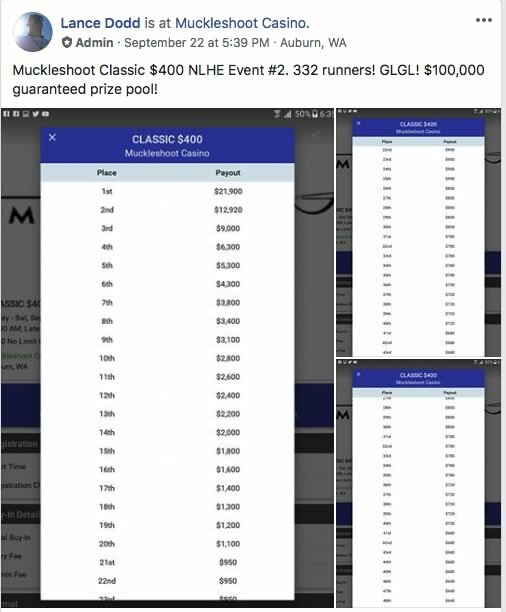 Muckleshoot Casino has a Big Bounty tournament ($200 buyin) on Sunday at 10:15am. Next Sunday is their $300 Deepstack. The Liz Flynt Fall Poker Classic at Hustler Casino in LA starts Sunday. It features a $15K GTD Big O tournament on 24 October and a $375 buyin $500K GTD NLHE tournament starting 27 October with Day 2 on 2 November. One of the smaller but nicer venues is WSOPC Lake Tahoe (or so I’ve heard). That kicks off 25 October, with the $1,700 buyin Main Event starting 2 November. 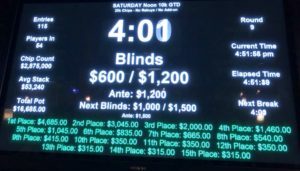 Up at Tulalip Casino, their Last Sunday of the Month tournament has $5K added, with a $345 buyin (including dealer appreciation). The Venetian Deepstack Extravaganza IV runs from 29 October through 25 November (Thanksgiving is the 22nd this year). The big event of the series is the $1,600 buyin $400K GTD Main Event starting 16 November. 1 November is the start of the Wildhorse Fall Poker Round Up. This year’s High Roller is regrettably front-loaded, with the only super satellite on the opening night—Thursday (and no satellite the night before). $40K in added monies. The HPT Championships are at Ameristar East Chicago starting 1 November. The Main Event buyin for this annual event goes up to $2,500. 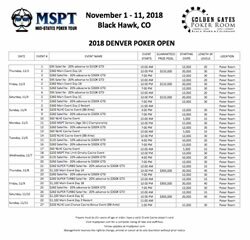 If you’d rather be close to the ski slopes, Mid-States Poker Tour Colorado starts 1 November, as well, opening with a $150K GTD tournament and finishing with $300K GTD for a $1,100 buyin. The Commerce Casino LA Poker Open starts 2 November. It features 18 events over 17 days, with a $500K GTD Main Event. Just west of Edmonton, Alberta, River CreeKing of the Felt Deepstack Championship resort hosts the starting 3 November, with seven events including PLO, NLHE/PLO/Crazy Pineapple/Limit Omaha Mix, and 2 “Limited” Holdem events! Their C$1,100 Main Event gets you 125,000 chips! “Coming” or “up”…we’re going to find out in three months. Dropped into The Game last week for their advertised PLO evening and found out the game had gotten going a little early, and everyone (well, five of them) had agreed on a mix rotation of PLO and Big O. Personally, I’d come for the PLO because I don’t get to play much of it live in person whereas I can go to Portland Meadows pretty much any night if I want to play Big O (and I haven’t been there much for that) but I’d driven through evening traffic for 45 minutes to get there and figured I’d sit down for a bit. Lost a little in the first hands (Big O), gained it back with extra in the PLO round, then lost my buyin and a rebuy in quick succession during the next Big O round. It took me less time than the drive to get there. Probably not doing that again. 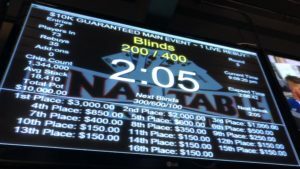 The turnout for Friday’s $10K at Final Table was light but they made the guarantee. The small field meant I got sort of close to the money, but I went out with a full third of the field left. Saturday, I busted four online tournaments at Ignition Casino, including one $11 buyin $10K GTD where I was 5th in chips with 400 of the 992 entries remaining but got my queens cracked by jacks for a double-up of a short stack, thengot the short end of three more spots where I was ahead to double up three more players, ending up with me busting in 211th place, thirty spots short of the money. I bought a piece of Jason Marshall Brown‘s attempt at the Muckleshoot Fall Poker Classic Main Event last weekend, and he pulled through like a trooper, cashing for the minimum, but cashing nonetheless. The payout structure for that event was exceptionally slow to rise at the bottom. Tuesday, I wandered back over to Final Table for their $1500 GTD, which missed the guarantee by a single buyin. I got to the final table (new chairs!) as one of the short stacks, but managed to hold on until there were just three of us left, doubled up through Saigon Vic by shoving deuces and flopping a set, then negotiated a chop with Vic and Benson that gave me better than 2nd place money. New final table chairs at The Final Table Poker Club. This week it’s the $20K at Final Table for me (it did not work out well), then evaluating what to do for the two weeks before the start of the Chinook Winds Fall Coast Classic. 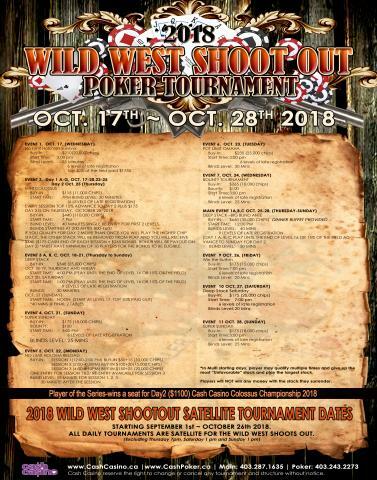 I’m planning to be there for the entire run, then out to Pendleton for the opening weekend of the Wildhorse Fall Poker Rodeo (who thought having the only satellite to the opening weekend High Roller on Thursday was a good idea?). After taking the week off from work for Chinook, I’m not likely to be spending any weekdays in Pendleton. If I’m feeling frisky after Chinook, the Main Event of the WSOPC Lake Tahoe is the same weekend as the Wildhorse High Roller. There are a couple of other Ring events that weekend and they’ve got a satellite Friday night for the last flight of the Main. WPTDeepstacks Thunder Valley, Lucky Chances Gold Rush, WSOPC Planet Hollywood…all on the potential list. Might take a stab at WPT Five Diamond for a side event. And EPT Prague is still calling to me for my birthday. Here are previews and links to all of the schedules I cold snag for the next three months. Way over on Cyprus at the Merit Gangsters Poker Open, James Romero took 7th of 74 in the $10K buyin High Rolle, as the only American in the money. Ridgefield’s Carl Oman came close to besting his career high in last fall’s High Roller in Pendleton by making it to the final table of the 496-entry HPT Colorado, finishing in 9th place. 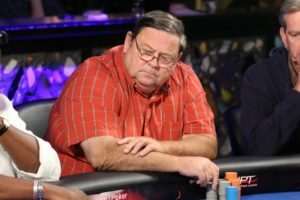 And close behind Carl was a name that first appeared on the Leaderboard last week, as Jeff Baxter from Oakland, Oregon took 11th place, for just his second recorded tournament cash. Abbreviated results from the Muckleshoot Fall Poker Classic are online. The Wynn Fall Classic runs through 14 October and features a $500K GTD Main Event, plus two $150K GTD side events, along with a Survivor, PLO, and Seniors event. 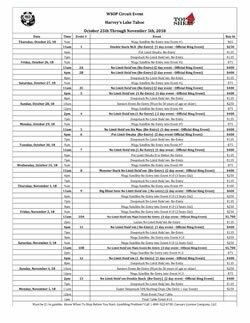 Bicycle Casino‘s Big Poker Oktober is back with two more $500K GTD events remaining on the schedule. Canterbury Park Casino‘s Fall Poker Classic has more than 20 events through 21 October outside Minneapolis. WPTDeepstacks San Diego finishes next weekend at Oceans 11 Casino in Oceanside, and has a $200K GTD Main Event starting 11 October. 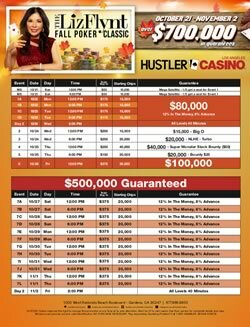 Stones Gambling Hall (outside Sacramento) brings back its own Fall Classic with a total of $250K GTD between 12–21 October. They open with a Win the Button tournament (that’d be killer with big blind antes). The Main Event (starting 18 October) is $500 for entry and $150K GTD. 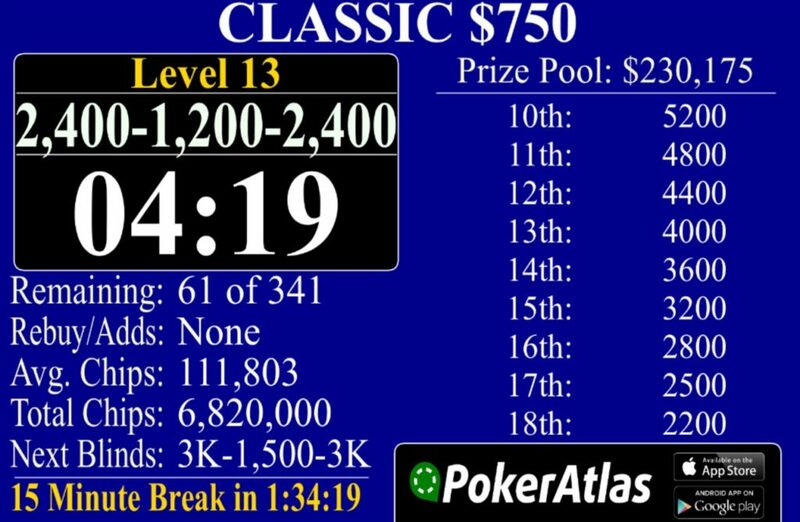 The Bay 101 Fall Poker Classic gets going mid-month, running about a week. It has a 2-day Main Event ($1,100 buyin) with entry days on 20 & 21 October. The Venetian October Extravaganza is a little aperitif before the last major series of the year there. There are a couple $100K events and a $150K, plus a couple Progressive Bounty tournaments. The folks at Calgary’s Cash Casino Wild West Shoot Out, need to get their web act together. The image they posted of their flyer is too small to read and isn’t linked to a larger version but PokerAtlas has it. Run It Up Reno has one of the more eclectic schedules with PLO KO, NLHE 6-Max, NORSE, 6-max HORSE(!) and a lot more, mostly for $125–$250 price points. I’ve heard it’s a lot of fun. The Chinook Winds Fall Coast Poker Classic is less than two weeks away. More than $750K in guarantees, with an opening $150K GTD tournament, $650 buyin $50K Big Bounty tournament, $100K GTD 6-Max, and $200K GTD Main Event. I’ll see you there. The last couple of weeks have been pretty light on poker for me since I headed to Moolack Beach just north of Newport with my wife and friends two weekends ago, Got a great AirBnB on a bluff above the beach with a bank of windows and a deck. The dark patch on the beach in the picture above is a hundred yards or so of crabs and kelp that washed up Friday night; the seagulls were having a field day. So I missed my usual $10K GTD at Final Table that weekend, but I managed to bust out of a couple of Ignition Casino Thousandaire makers—continuing a non-cashing streak that is now the longest since I started playing them three-and-a-half years ago. It’s starting to make inroads into my profit. I had been planning to head up to the $100K GTD at Muckleshoot Casino on Saturday, but with my poker travel partner out of commission I decided to spend my money at home, playing the $10K at Final Table on Friday night, then heading to Portland Meadows for the debut of their new $145 buyin freezeout structure $10K GTD on Saturday. Didn’t get close to the money in either one. I toyed with the idea of heading to Claudia’s for the Monday PLO8 (since that went so well the last time I played it) but since I’m expecting to be at The Game Tuesday for some PLO (writing this Monday night), I just played a small Ignition $500 GTD O8 game and took 3rd of 63 for a little cash. Not enough to make me ready to head up to the Muckleshoot Main Event this weekend (I’m kind of sitting on my money for the Fall Poker Classic at Chinook Winds next month), but I’ve got a piece of a friend for it, at least. A late but new entry on the leaderboard is Jeff Baxter from Oakland (north of Roseburg). 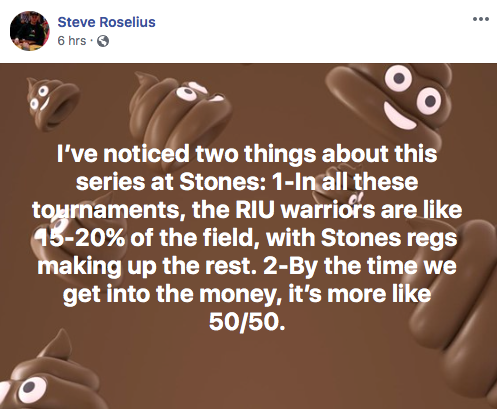 He took 3rd in a 199-entry HPT Vicksburg Main Event back in August, but his entry only showed up on The Hendon Mob in the past couple of weeks (perhaps because it had gotten mixed up with another player under the same name). It’s his only recorded tournament score. 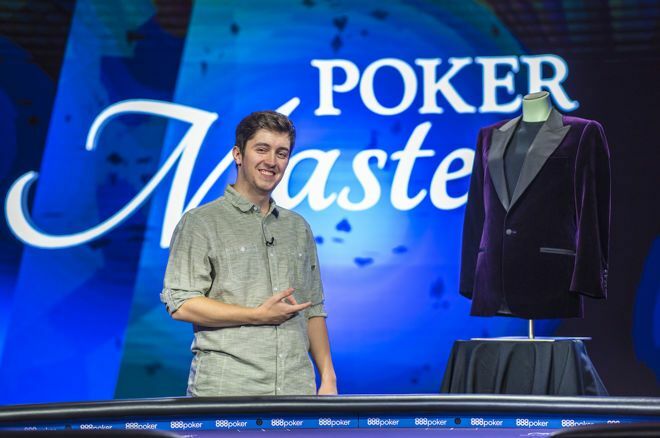 As mentioned in previous Planners, Ali Imsirovic doubled his already substantial earnings in two days by winning back-to-back tournaments at the Aria.PokerGO Poker Masters. Also not slacking off is Seth Davies who placed 3rd in the $50K buyin that was the second event Imsirovic won. Imsirovic jumps from 23rd on the leaderboard to 13th, while Davies moves from 12th to 10th. Calvin Lee is still working the circuit in Korea, at the Japan High Roller Festival, where he took 2nd in the KRW 10M NLHE Special High Roller. Max Young continues to crush US circuits with three final tables at WSOPC Thunder Valley, holding on for 9th in Event #3 $30K GTD NLHE, then placing 5th in both Event #10 NLHE 6-Max Turbo and Event #13 NLHE High Roller. 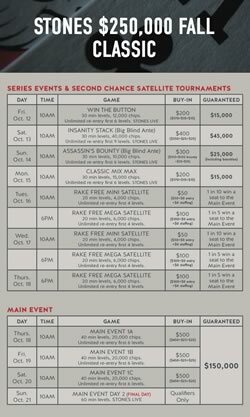 At the Muckleshoot Fall Classic there’s a satellite tonight (Wednesday) for $1,750 in buyins (7pm, 190 entry). Thursday is a $200 entry for the only non-hold’em event: $15K GTD O8. Friday is another $400 buyin $100K GTD. 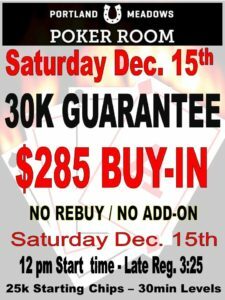 Saturday is Day 1 for the $750 buyin $150K GTD Main Event. The last event on Sunday is a $40K GTD NLHE Shootout. The Gardens Poker Classic runs through Sunday. Thursday, Friday, and Saturday, there are a total of six entry flights ($350 entry) for their $300K GTD Main Event. The WSOPC Online got going Tuesday. There’s a $100K GTD $350 buyin on Sunday. You can check in on the results from earlier events at WSOP.com. Sunday is the $525 Main Event with $200K GTD. $215 $25K GTD PLO 6-Max on Friday. How else can you win a Circuit Ring for less than you might spend on a First Friday at Final Table? Plus airfare to Vegas or New Jersey, of course. 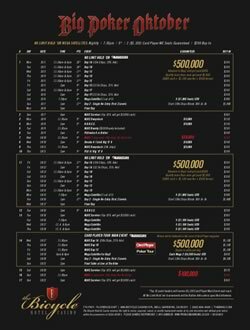 The Wynn Fall Classic runs through 14 October and features a $500K GTD Main Event, plus two $250K GTD and two $150K GTD side events, along with a Survivor, PLO, and Seniors event. Deepstacks Poker Tour Edmonton is at Casino Yellowhead Friday, with the C$1,100 buyin Main Event (now with BB ante) getting under way next Thursday. Other events include a bounty, 8-Max, Seniors, and Ladies tournaments. The Main Event is about US$850. Lucky Chances Casino near San Francisco has their monthly $350 buyin $20K-to-first guarantee tournament Sunay at 9:30am. It’s kind of a turbo structure with 20-minute rounds for the first two hours. There’s a Last Sunday of the Month tournament at Tulalip Casino at 11am. $25K GTD with a $100 bounty. $340 buyin including dealer appreciation. Big blind antes! Bicycle Casino‘s Big Poker Oktober is back on 1 October, opening with a Quantum $400K GTD tournament ($245 and $365 entry flights, with 10% and 15% getting to Day 2, respectively). They have another $400K GTD ($1,100 buyin) in conjunction with the CardPlayer Poker Tour mid-month. Canterbury Park Casino‘s Fall Poker Classic has more than 20 events from 5–21 October outside Minneapolis. Lots of tournaments including PLO, 6-Max, HORSE, Crazy Pineapple, and the $1,100 buyin Main Event. Should you be silly enough to blow off the first weekend of the Fall Coast Classic at Chinook Winds, you can get there for the Main and have a place to stay for about $500. 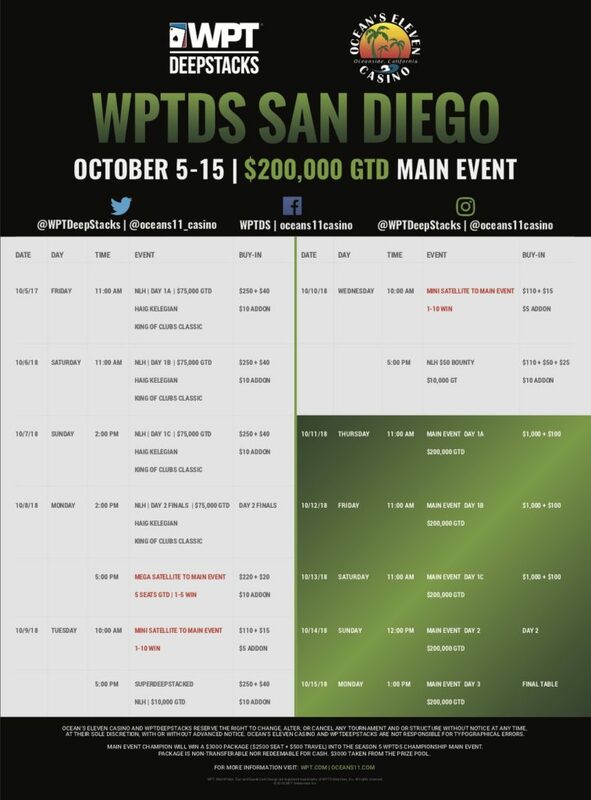 WPTDeepstacks San Diego runs 5–15 October at Oceans 11 Casino in Oceanside, and has a $200K GTD Main Event starting 11 October. 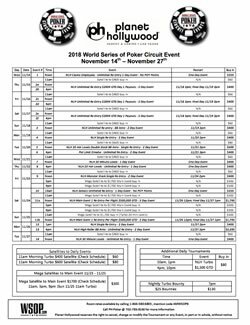 5 October is the starting day for WSOPC Chicago (actually northwest Indiana), featuring a $1M GTD Main Event overlapping the first weekend of the Chinook Winds series. By all accounts, he’s been incredibly successful for several years on Bovada and—particularly—America’s Cardroom, but at this time last year, his total live recorded cashes were for less than $70K. By the time the Poker Masters started, he’d ramped that up to $1.2M, and the money he made last week doubled that. From @aliImsirovic's interview @gripsedpoker, broadcast this spring but recorded last fall, when his biggest live win (@shrpo 3/17) was still just $11K. See the 28 August Planner for info about the Muckleshoot Fall Classic starting this weekend. There’s a satellite tonight, events on Friday, Saturday, and Sunday, then satellites Monday through Wednesday nights before the four events next weekend. The Venetian Deepstack Extravaganza III continues through Sunday. 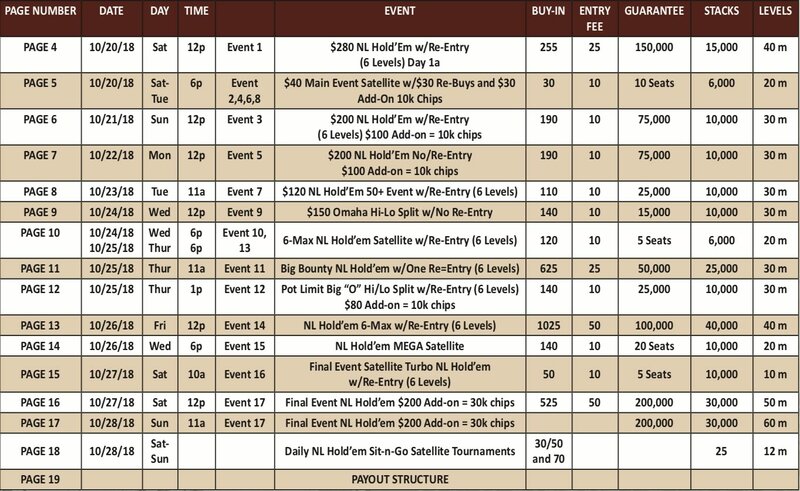 Entry days for the final $250K GTD event run through Saturday with a $250 buyin. HPT Golden Gates $1,650 Main Event stared today with entries through Saturday and Final table on Monday. The Gardens Poker Classic started last weekend, there’s a $100K GTD Friday at 2pm [170e100a], with the $50K GTD PSPC Moneymaker event (guarantee includes the $30K PSPC package) on Saturday. The $350 buyin $300K GTD Main Event starts next Thursday. The WSOPC Online got going Tuesday. There’s a $100K GTD $350 buyin on Sunday. The Pechanga Endless Summer Poker Series f$200K GTD Main Event ($400 buyin) starts Friday. 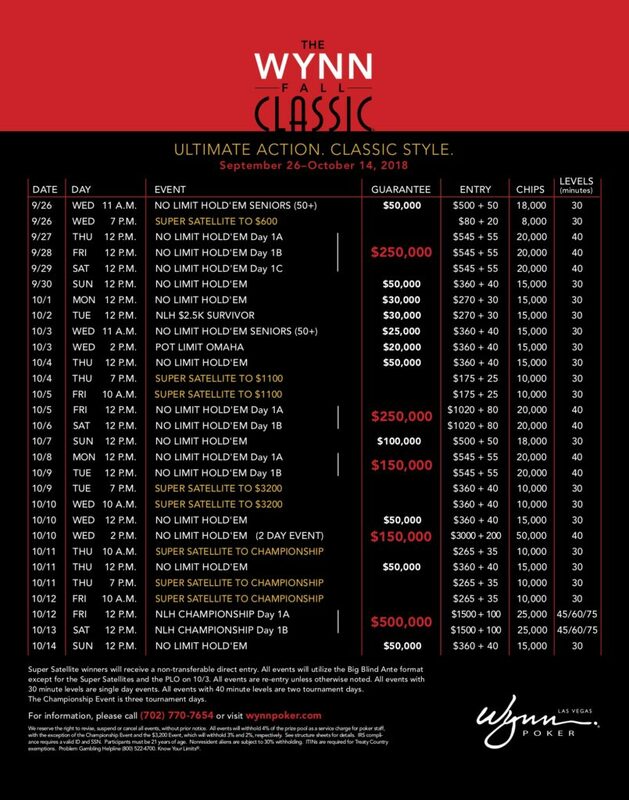 The Wynn Fall Classic runs 26 September–14 October and features a $500K GTD Main Event, plus two $250K GTD and two $150K GTD side events, along with a Survivor, PLO, and Seniors event. 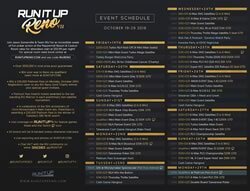 Deepstacks Poker Tour Edmonton is at Casino Yellowhead s week from Friday, with the C$1,100 buyin Main Event (now with BB ante) getting under way 4 October. Other events include a bounty, 8-Max, Seniors, and Ladies tournaments. The Main Event is about US$850; RT flight and a room near the casino for the last few days of the series can be found for about US$450. Lucky Chances Casino near San Francisco has their monthly $350 buyin $20K-to-first guarantee tournament on the last day of the month at 9:30am. It’s kind of a turbo structure with 20-minute rounds for the first two hours, but a prize pool with a 5700% potential return is nothing to sneeze at. There’s a Last Sunday of the Month tournament at Tulalip Casino on 30 September at 11am. $25K GTD with a $100 bounty. $340 buyin including dealer appreciation. Big blind antes!